I like to attempt minor DIY projects around the house because 1) it saves money and, 2) it’s enjoyable to solve technical issues that don’t involve staring at a computer. Recently, I decided to wire the living room with recessed lights. There is no existing light fixture in the ceiling so I had to use power from a receptacle and wire in a new switch to control the lights. I didn’t want to cut through the wall board, run wire and then find out that I didn’t know how to actually wire into the receptacle. So, I decided to approach the problem much like I do when faced with a daunting programming problem – by unit testing. I pulled out the receptacle, examined the wiring, and scratched out a plan on a piece of paper. Then I wired a light switch and cheap single bulb fixture off of the receptacle. Luckily, it worked without major adjustments or shocks. And it entertained the kids for about 3 minutes. I then was able to confidently cut through the wall and wire in the switch, solving one piece of the puzzle and allowing me to focus on installing the overhead lights. As a design technique, Test-Driven Development (TDD) allows us to break down complex systems into smaller, more manageable chunks. Once you’ve written tests to satisfy a cohesive set of requirements, you commit the code and move on to the next set. Isolating the problem is also useful when debugging a system issue that is buried under layers of UI, database and middle-tier abstractions. Remove each layer until you’ve discovered the likely culprit. Or build a simple prototype and isolate the misbehaving module. It’s easy to get overwhelmed by a complex system when trying to decide where to begin. It may feel like a house-of-cards, teetering on the verge of collapse with the next interruption. 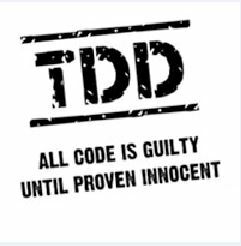 Consider TDD as not just a test fixture, but as a design technique that helps narrow the scope. And as for wiring a home – keep it simple and remember to cut off the power.